Researchers at McMaster University found the words most disproportionately typed out by Twitter users on both sides of the border line up with national stereotypes — Canadians tend to be polite and positive while Americans are more assertive and negative. It seems the stereotype that Canadians tend to be more positive and polite than Americans is true — at least when it comes to language use on Twitter. Sorry! A new study published by McMaster University researchers Wednesday analyzed nearly 40 million tweets from both countries including some from Donald Trump around the time of his campaign to become the Republican nominee for president. 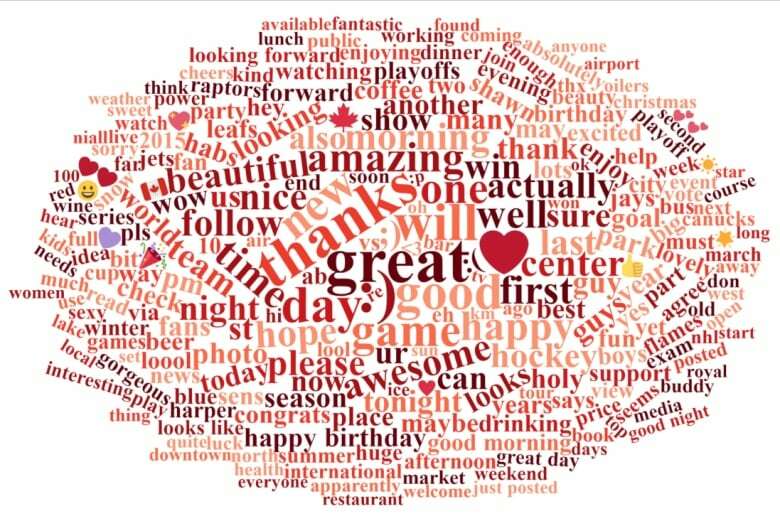 While the team found the vast majority (99.66 per cent) of words, emojis and emoticons were not drastically different, a list of words which were typed out most disproportionately by Twitter users in Canada and our neighbours to the south shows a distinct difference in tone. After compiling lists of those words the linguistics experts had study participants evaluate the words and determine what they think the personality of the person who used them would be. The result? 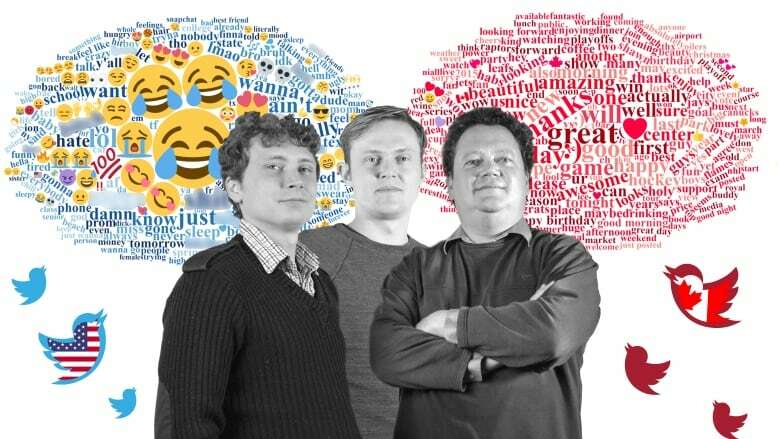 National stereotypes seem to be connected — at least in part— to the words people use online. Researchers found Canadians tend to be nice, while Americans are more negative and assertive. "What you get back out of that is a really, really accurate recreation of the national character stereotypes," explained Bryor Snefjella, a PhD candidate in the school's department of linguistics and languages and lead author of the study. "Canadians say 'great,' 'amazing,' 'good,' he explained. "There are lots of things about sports, 'team,' 'game,' 'awesome' … 'Leafs' gets in there, 'Habs' does too." But across the U.S. border, the words used take a turn. "You're talking about words like 'hate,' lots of slang, 'bro,' 'brah' and net-speak. 'Hurt' comes out as an American word, lots of negative, bad stuff and lots of words you wouldn't want to say in front of your grandma." The study also revealed some interesting points when it comes to emojis and emoticons. Snefjella said Americans tend to use more emojis — tops picks including the face crying tears of joy, skull and face with hearts for eyes — while Canadians tend to spell out their smiley faces using punctuation :). Meanwhile, the emojis Canadians do use are also overwhelmingly positive and include the heart, party horn and maple leaf. The work follows a similar study Snefjella and his co-author Daniel Schmidtke completed in 2016, which looked at three million tweets from both countries. This time around the tweets the team analyzed were all posted between February 2015 and February 2016. The country of origin for each post was confirmed using GPS coordinates. In recent years, Twitter has become one of the most popular social media platforms and a tool for politicians and members of the public to interact. U.S. President Donald Trump is among the most prolific and high-profile Twitter users today and it seems not even the study could escape his influence, even though he wasn't yet elected when the data was being collected. "Interestingly he is one of the only celebrities who didn't turn the GPS feature on his phone off," said Snefjella who explained Trump's account popped up while researchers were reviewing some of the most retweeted posts in their data. "He's in there, a tiny fraction of the 40 million." Snefjella said he and his fellow researchers, Schmidtke and Victor Kuperman, didn't set out to examine national stereotypes. He noted social psychology studies surveying large numbers of Canadians and Americans have consistently shown national stereotypes are not accurate and have not provided any hard evidence the average citizen of either country has different personality traits than the other. "The Twitter behaviour we observe doesn't actually reflect the real underlying personality profile of an average American or Canadian," said Schmidtke. Instead, the team believes their work indicates that when Canadians and Americans take to Twitter they're essentially creating their national characters through the words they type. "Maybe it says being Canadian is something we do and one way we do it is through our language choices," said Snefjella. "Don't just look at study and say 'Ah, of course, Canadians talk nice because they're nice and Americans talk rudely because they're rude.' We're saying exactly not that. What we're arguing for is the possibility of an identity construction strategy through language." A previous version of this story said some of the tweets included in the study were posted by Donald Trump during his campaign to become president. In fact, the tweets were made around the time of Trump's campaign to become the Republican nominee.